Some new photos from the set of The Walking Dead's seventh season have surfaced online and, assuming the show is filming in chronological order, they reveal three people who Negan did not kill. Be warned, potential spoilers follow. The photos from the Senoia set of the series show Andrew Lincoln, Danai Gurira and Ross Marquand all alive and well on set, meaning Rick, Michonne, and Aaron probably did not meet the business end of Lucille. Also photographed is Alanna Masterson who plays Tara on the series but her character was not one of the potential candidates so her survival is not as surprising. Of course, the possibility exists that the scene caught on camera by paparazzi is a flashback similar to what the show did with Hershel a few seasons ago at the prison. 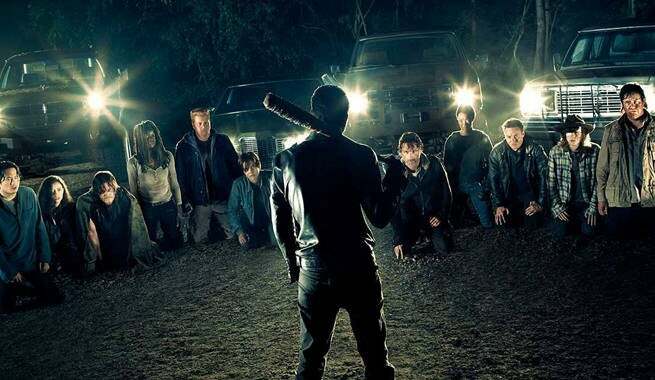 Greg Nicotero has previously teased that the show may even film out of order to keep fans like the ones who took the new photos from figuring out who it was the Negan killed. To see the photos for yourself, head over to Just Jared. Other than the survivors, a pair of new faces are also seen in the new photos, as well. As for who they're playing, it's anybody's guess. They may be friends, they may be foes. In fact, they may be part of the group who the show is currently casting a leader of or the vaguely introduced characters seen in Tara's treacherous adventures through the woods in the Season 7 trailer. The Walking Dead is currently filming the ninth episode of its seventh season after a brief hiatus following the wrap of its midseason finale. The Walking Dead will return for its seventh season on October 23 at 9 PM ET on AMC. For complete coverage, insider info, and more all season long, follow @BrandonDavisBD on Twitter and check out The Walking Dead on ComicBook.com on Facebook.